For authentic sounding EPs in a high-quality, portable package, the CP really delivers the goods. Great value. Portable. Excellent sounds. 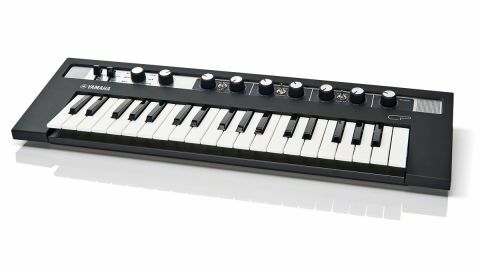 Although Clavia/Nord has been at the forefront of electro-mechanical piano emulations recently with the Electro/Stage series (alongside Korg with its SV-1), Yamaha's full-sized CP range (which uses a mixture of Spectral Component Modelling and sample-based AWM2 to create very authentic electric/acoustic piano sounds) is still very highly regarded too. The Reface CP houses the same basic sound engine as the larger and more expensive CP-series models but in an infinitely more compact/ portable package. However... Don't expect any acoustic pianos here, as there's not enough memory onboard (APs are inherently more complex than EPs and take up more memory). The Reface CP is built into the same high-quality plastic housing as the other Reface models and features the same battery/wall-wart power and mini- speakers - these sound very good considering their size and can be turned off (if required). Unlike the smooth plastic on the other Refaces, the CP has a textured plastic finish to reflect the tolex covering and vinyl-look plastics used on electro-mechanical pianos of old! There are six emulations onboard - Rhodes Mark 1 and 2 models (Rd1 & 2) a Wurlitzer EP200 (Wr), Hohner Clavinet (Clv), Toy Piano and CP (Yamaha CP80 electric grand). This covers most of the EPs you would normally want to use, though the toy piano is an odd choice and it would have been more useful to have a more versatile model such as the Hohner Pianet included, or perhaps a muted Clavinet model. Like the other Refaces, the emphasis is on real-time, hands-on performance, so there are no menus (which is great) but also no memories to capture your favourite settings. Once again though, (if you own an iOS device) Yamaha has a free patch storing//setlist App called Capture, which helps to navigate around this hardware deficiency. Sonically, we're happy to report the Reface CP is pretty impressive. Sure, you only have a three-octave velocity- sensitive keyboard (though one that feels very nice as it stands) but connect a sustain pedal and a weighted controller and use it as a sound module and you'll likely be very happy with the all-round authenticity and response of the onboard pianos. You could easily use this on a pro-level gig for Rhodes, Wurli, Clav and CP80 duties - throw it in your backpack, hire a weighted board at your gig and off you go! The Rhodes Mk1 is warm, the MK2 is brighter with more attack when you dig in (though the sample's velocity- switching is more noticeable between layers via the onboard keyboard), the Wurli sounds great, and the Clavinet is one of the more authentic clav samples around, with some nice sympathetic- resonance and vibe for days! The CP80 (while generally sounding great) lacks a little punch in the attack for our liking but the Toy sample (while also sounding authentic) is the odd-ball! All things considered though, we'd have no hesitation using any of the sounds solo or in a band context. The effects are similarly authentic and selected using the retro (but fiddly!) flick-switches. Firstly, the Tremolo can function as a standard basic tremolo, or simply increase the depth for full-on, Rhodes Suitcase-style stereo-panning. The auto-wah is great for more funky sounds (especially good on Clavs) and you can also use the rate control as a pseudo-EQ control for all the sounds (which gets you a lot more mileage out of the basic sounds). What's more, the chorus and phaser sound superb, (adding depth and thickness in all the right places), while the analogue delay is one of the nicest emulations we've heard - very dubby and tapey! To top things off, there's also a very decent digital delay and a lush reverb, both of which really bring the dry sounds to life. To sum up - an impressive little keyboard that contains sounds that can compete with more expensive, full-size EPs. If you want an extremely portable, yet high-quality EP emulator, then look no further!